Politics and the upcoming 2016 election are most definitely “center stage” if you watch, read or listen to the news these days. 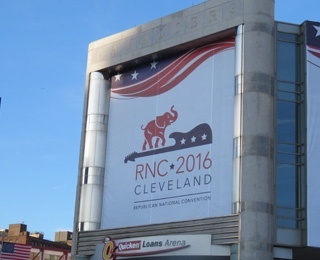 A few weeks ago, those of us who live in northeast Ohio were able to watch the political process unfold close to home, when Cleveland hosted the Republican National Convention. Regardless of political party, this was Cleveland’s chance to shine in the national spotlight. And, in my opinion, the city rose to the occasion. As a lifelong resident of the area, I saw the city present an image of a vibrant and exciting place to be, whether you are a resident or a visitor. So maybe a little history would be appropriate here. Cleveland hasn’t always had a rosy reputation. It’s a rustbelt city with a history of challenges. But things have been changing in our region in a very positive way. Downtown Cleveland has seen a renaissance with new buildings, a new convention center, urban housing growth, and a bustling restaurant scene. So here we are in the summer of 2016. The city has just finished celebrating its first major sports championship in 52 years with the Cleveland Cavaliers winning the NBA Championship. The parade brought over a million fans into downtown Cleveland to celebrate. If that wasn’t good practice for crowd control, I can’t imagine what is! The planners had been working for months to get ready for the delegates, media and visitors that would be in the city from July 18 to 21 for the RNC. My husband and I drove around downtown a few days before it all started to look around and take some pictures. I haven’t seen the city look so good in many years. Public Square had a fresh new look, flower boxes overflowed with fresh flowers, restaurants had their patios open and they were filled with patrons. 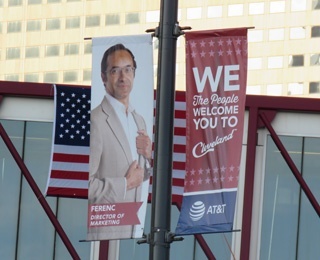 Welcoming banners were hung on lamp posts throughout the city – “We the People Welcome You!” – and highlighted community citizens from all walks of life. The Rock and Roll Hall of Fame hosted social events throughout the week. Safety was of primary concern for planning. The local police had help from all over the country — so they were there in large numbers. Yet, they were a friendly presence, riding on bicycles and on horseback, interacting with people throughout the city. The result was very little disruption and few arrests. An article in the Washington Post states that some were expecting riots, but “we got a block party instead.” We even saw our Chief of Police, riding with his bicycle officers, working side-by-side. Nice work Calvin Williams! Now that the RNC is in the books, the city and the planners have hosted an event to thank the community for all the effort that went into the convention. There was a party on Public Square, including music by the Cleveland Orchestra, free admission to the Rock and Roll Hall of Fame, and more. No question, everyone is grateful for the effort, pride and hospitality that the people of Cleveland brought for our visitors. Nice job everyone! Is this a new beginning for our town? I hope so. Cleveland has shown that it can accommodate larger conventions and events. Yes, the city cleans up nicely. I’m happy to call Cleveland and northeast Ohio home! The city of Cleveland is short drive (less than an hour) from Kendal at Oberlin. 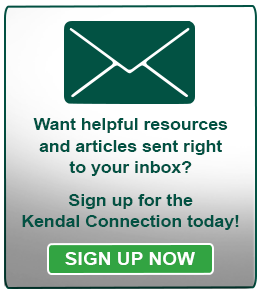 Kendal residents have opportunity to enjoy the museums, restaurants and the Cleveland Orchestra, as well as proximity to the Cleveland Hopkins International airport.